Home > CS Santosh > CS Santosh in 2016 Dakar rally. CS Santosh in 2016 Dakar rally. Be it dirt tracks or rocky terrains, slippery slopes or dunes in the dessert, Santosh is prepared more than ever before and is determined to put India on the world map of off-road rally racing through the formidable Dakar Rally. Winning numerous accolades over the years, including Maruti Suzuki Desert Storm, Maruti Suzuki Raid de Himalaya, Fox Hill Supercross, Asian Motocross Championship and many more, he is undoubtedly the country’s most accomplished rally-raid rider. Santosh has become an inspiration for the aspiring young racers in India, which he considers as a bigger achievement, creating template for the still budding sport in the country. Like previous editions, 2016 Dakar continues to pose formidable challenges for the participants. The rally will run over a total distance of over 9,000 km out of which over 4,500 km will mark the 13 competitive stages that will be run against the clock. Making things even tougher for riders like CS Santosh, are the two marathon stages in which no outside mechanical assistance will be allowed at the end of the day. This means, after a long hard day of riding, the riders will have to service and repair their bikes without any help. The 2016 Dakar starts from Buenos Aires and finishes in Rosario -- the hometown of iconic Argentinean footballer, Lionel Messi. The 2016 Dakar will spend two nights above 3,200 metres (approx 11,000 feet). On the 5th competitive section, riders will have to deal with several high passes on their way to Bolivia, including a crossing at 4,600 metres (over 15,000 feet), which will be the highest point of the Dakar story in South America so far. With Peru not on the agenda for the 2016 Dakar, the organizers of the rally-raid have introduced several new sections that will pose severe navigational challenges for the riders, who are first out on the tracks ahead of the quads, cars and trucks. A total of 152 moto riders will come under the starter’s orders on the departure ramp at Buenos Aires. CS Santosh has been allocated competition number 56 for this 2016 Dakar, which is the same as last year. 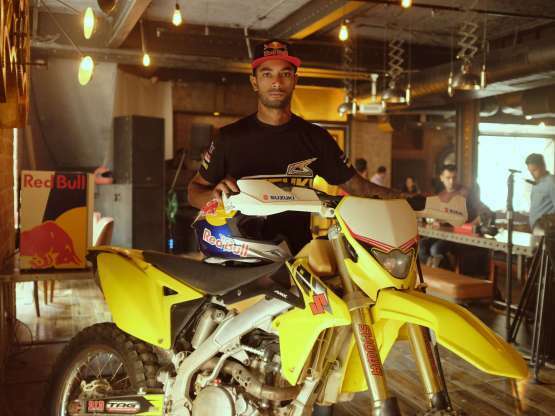 The Indian ace will be blazing new trails in the toughest race on the planet astride a Suzuki 450 Rally, which has been specially prepared to survive the rough challenges of the 2016 Dakar.